There are lots of myths and half-truths around the keeping of betta fish. Because they’ve evolved over the years to be able to survive in harsh conditions, many people think it’s okay to keep them in tiny bowls, jars or other weird and wonderful setups, without adequate heating or filtration. They key word there is “survive.” Yes, a betta might survive for some time in a small bowl, but they wouldn’t be happy or healthy. For your betta fish to thrive, you need a decent sized aquarium with heating, filtration systems and all the proper extras and accessories to make them happy. We’re going to shed some light on what exactly makes a good betta aquarium and how you can go about choosing the right one. Even when you know what you should be looking for, there’s so much choice out there it can be an overwhelming decision, searching for the best betta tank. So, we’re also going to roundup and review some of the best tanks for betta fish, listing our favorites to make things as easy for you as possible. Should You Choose Acrylic Or Glass for a Betta Tank? What Size Aquarium Should You Choose? What Shape Aquarium Should You Choose? What Extras And Accessories Do You Need? What Shouldn’t You Put In A Betta Tank? How Do You Set Up Your Tank When You Get Home? One of the first decisions you need to make is whether you want a glass aquarium or an acrylic one. It’s important to note, neither is inherently better than the other. Some fishkeepers are diehard fans of either acrylic or glass, so they’ll try to tell you one or the other is the best option. The truth is, however, that both materials have their pros and cons. We’re going to look at the good and the bad things about each so you can make up your mind for yourself. Think about it this way, whichever aquarium you choose is likely to be your bettas only home for the rest of their life. If you want to give them the most pleasant and enriching experience possible, choose the largest tank you have space for and can afford. Although, betta can survive in a small fish bowl, anything under 5 gallons isn’t ideal. The absolute minimum to keep them comfortable and healthy would be a 2.5-gallon tank. If you go any smaller than that, your fish would have no room to swim. Plus the water would quickly become polluted and they’d essentially be swimming around in their own waste. Assuming you have space, it is better for both you and your fish if you can go to a 5 gallon tank, however. If you have a tank smaller than 5 gallons, you’ll need to do a weekly full water change, which can be time-consuming. It can also be difficult to properly heat and filter a small tank, and the filtration devices that come with them may be substandard or unsuitable for bettas. If you select an aquarium that’s 5 gallons or more, you only need to do a partial water change of 10 to 15 percent weekly, as this is large enough to build up a proper nitrogen cycle. There are also nano-filters and heaters available for tanks of this size that are of a much higher quality. However, for those who have space and want the best possible conditions for their betta, we’d recommend going for an aquarium of at least 10 gallons. An aquarium of this size is large enough to accommodate some tankmates without it being too cramped or your betta getting too territorial. We’re sure it goes without saying, but you can never keep 2 male betta together, no matter how large the tank! Note: If you’re unsure on compatibility, you can check out our guide to the best betta tank mates. Once you go over 10 gallons, a tank can establish itself as its own mini-ecosystem. Healthy bacteria colonies thrive in the filter and the substrate. This helps to break down waste and also makes for a healthier environment to keep your fish. Once these colonies are well-established, you may also be able to cut down on partial water changes to once or twice per month, which is good news for any lazy fishkeepers out there. Bettas naturally live in shallow water so they prefer to live in an aquarium that’s wider and shallower to most traditional aquariums. Choose a tank longer than it is tall to make the best home for your betta. That said, a larger tank will still provide extra room for them to swim. So, if you have a maximum width you have room for in your home, but no maximum height, it’s still better to go for a larger volume even if it means it’s taller than it is long. The main thing to avoid is a spherical bowl-like tank. The curved glass severely distorts the world outside for the fish and can stress them out. A secure lid: Betta fish are well known for their escape attempts and will try to leap to freedom if you don’t have a lid on your tank. Unfortunately, the outside world is too dry for our little friends and you’re liable to come home to a dead fish on the floor, which nobody wants. A heater: Bettas are tropical fish and need to live in water of between 75 and 80 degrees Fahrenheit. So, unless you live in a warm climate, you’ll need a heater. You can pick one from our list of the best aquarium heaters if you don’t have one already. 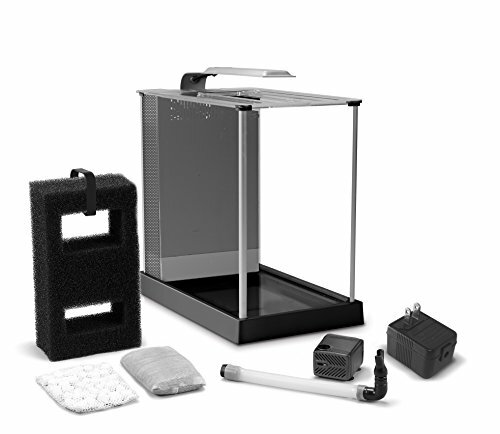 A filter: Most aquariums come with some sort of filter, but depending on the type, you may need to replace it with one more suitable for bettas. They don’t like a strong water flow or bubbles in the water, so air pump type filters aren’t ideal unless you can adjust the flow. Substrate: You’ll need some sort of substrate for your betta tank. Pebbles are better than aquarium gravel, especially in smaller aquariums, as you can take them out to clean to help maintain good water quality. Learn more in our article on substrate for betta tanks. Plants and ornaments: Like most fish, bettas like to have some cover and places to hide. Live plants, fake silk plants and ceramic tank ornaments are all good choices. Terracotta plant pots: There has been a trend for adding real plant pots to aquariums that were designed for garden use. The problem is, they’re not meant for this purpose and the drainage hole is often sharp, which could injure your fish. Fake plastic plants with sharp leaves: Fake plants are fine for betta fish tanks but make sure you don’t pick one with sharp leaves as these could damage their delicate fins. Silk plants are ideal, as plastic types are often too sharp. A second male: We’re sure any potential betta keepers already know this but you absolutely cannot keep more than one male betta in the same tank or they will attack and kill one another. If you have a volume of 10 gallons or more, you can potentially add a few females, or other more peaceful fish varieties. Now you know a little more about the tank requirements of betta fish, we’re going to show you some of our favorites. Every one of the models listed below have been chosen because they represent some of the best available in different categories, but all being perfectly suited to home a happy betta. 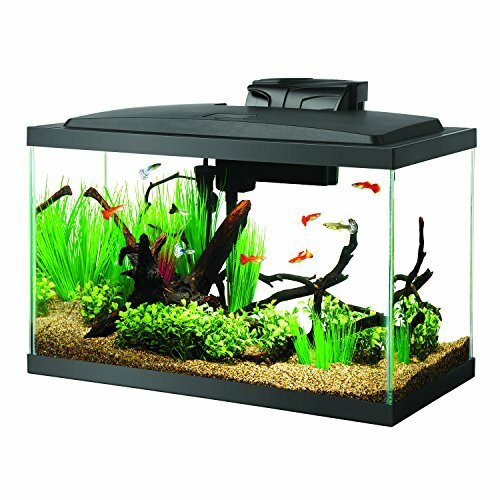 If you want the very best betta tank, and an easy setup for yourself, one of the first 3 are the tanks to go for. You’ll notice all our top picks are 10 gallons or larger, as we think this is the best way to go if you have the space. A 10-gallon tank is large enough to give a good quality of life, and to establish a cycle of good bacteria to help improve the aquatic environment. Plus, if you want to keep any other fish or aquatic creatures with your betta, you definitely need a minimum capacity of 10 gallons! This is probably our favorite tank on the market for a newbie fish keeper. It comes with everything you need to get set up, except plants and ornaments. And the fish, of course. This 10-gallon glass tank is great quality for a first aquarium. 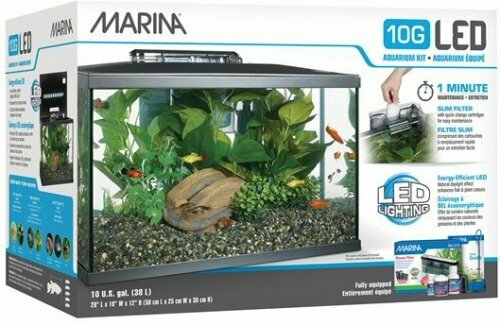 It comes with LED lighting in the hood, a quiet flow filter with cartridge, a 50W heater preset to 78 degrees Fahrenheit (which is perfect for a betta), substrate, a fish net, a thermometer, and even samples of food and water conditioner. For those who want the same convenience, just with something larger, it’s also available in a 20 gallon size. 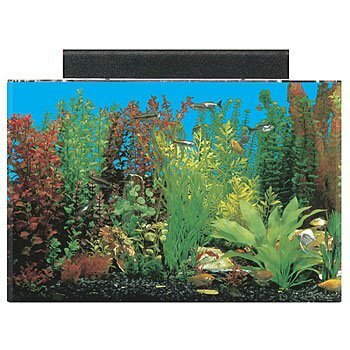 This is another great aquarium kit for those starting out. We’re showcasing the 10-gallon tank here, but it also comes in 5 and 20-gallon varieties. Although you will need to buy a heater, an appropriate substrate and any plants and decorative items, it has just about everything else covered. Along with the tank, you’ll receive a slimline clip on filter, LED lighting, a net, food, water conditioner, and a supplement to help quick-start a colony of good bacteria in the aquarium. This 20-gallon aquarium might seem like overkill for a single betta, but if you’re planning on keeping them with any tankmates, you’ll need something of an adequate size. This is an acrylic aquarium, so it’s stronger and clearer than its glass counterparts. What you’re getting for your money is just a basic setup of the tank itself, the hood, lighting fixtures and a reflector. This means you’ll have to go out and buy your own heater, filter, bulbs and anything else you require. This might be daunting for anyone who’s setting up their first aquarium, but could be a bonus for a more experienced fish keeper or anyone who’d rather be fully in control of what filter and heater they use, rather than being stuck with whatever they got with the tank. This is a selection of 5 to 10-gallon betta fish tanks, perfect for anyone who just wants to keep a single male. A 5-gallon tank may still be large enough to build up some beneficial bacteria if kept properly and will generally provide a more enriching environment for your betta. This is not only an excellent quality aquarium, it also looks great and makes a showpiece for your home. The six-gallon capacity is fine for a single betta, but it also comes in a larger 12-gallon model for those looking for something bigger. 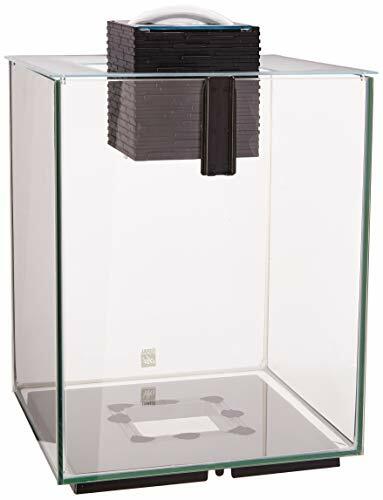 It has a decorative column and partial hood that houses the filter, LED lighting and all the wires, but the rest of the lid is glass, so it looks very different to your average tank. It also comes with water treatments, but you will need to buy everything else you need separately, such as a heater, substrate and plants. Speaking of plants, you might need to stick to silk ones because the LED light isn’t powerful enough to keep most aquatic plants alive. However, it might sustain some low-light varieties. This model has a stunning design, which is more like a combination of an aquarium and a water feature. A gentle filter pulls water out of the tank and lets it trickle back in. At first glance, you might be worried that this creates too much water movement for betta, but many owners have said it’s gentle enough not to disturb their fish. It has a 5-gallon capacity, which is fine for housing a single male. It comes with a filter and LEDs, but you’ll need a filter to maintain the correct water temperature for your betta. Like the tank above, the LED lights are a little weak, so it’s not the best option if you want a densely planted look, although you may be able to keep a few low-light plants. While we think that, if possible, you should go for a tank of at least 5 gallons, there are slightly smaller options available. As mentioned above, we would never recommend an aquarium of less than 2.5 gallons. Smaller tanks can lead to poor quality water and generally speaking, a poor quality of life for your fish. The Fluval Spec III is a 2.6-gallon aquarium, so is perhaps not the best betta tank overall, but is ideal for those who don’t have space to house a larger tank. Made from etched glass with an aluminum trim, it comes with almost everything you need to keep a betta happy. It comes with a powerful filter that should keep the water clean enough even in this compact space. There is also a 31 LED lighting system that will help regulate night and day for your betta, and which is strong enough to maintain some live plants if desired. If you’re searching for an aquarium that’s functional but will also look decorative in your home, the following is an excellent choice. 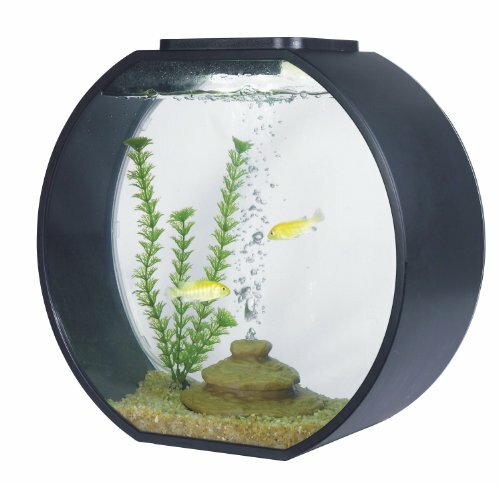 This sleek tank is like a contemporary take on the classic fishbowl, but without the curved sides and spherical shape that can stress fish out. 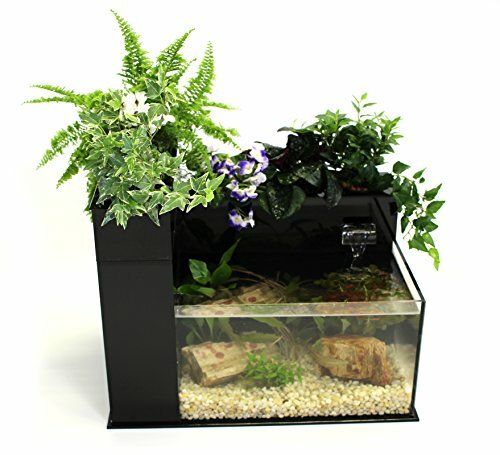 It comes in a 5-gallon capacity, ideal for keeping a betta in, and also in a smaller 2.6-gallon capacity which is adequate for those struggling for space. You are going for somewhat style over substance with this model, however. The air bubble filter isn’t suitable for betta, so it will need to be replaced with something like a sponge filter, a nano filter or anything with a low output that won’t create bubbles or too much water flow. You’ll also need to find a suitable heater as this tank doesn’t come with one. For those who don’t know, aquaponics is an interesting way of fishkeeping more in line with nature. It uses plants, rather than filters, to keep the water clean, while also creating a gorgeous natural-looking environment. However, it doesn’t mean you can totally check out as a fishkeeper just because your tank predominantly maintains itself. You still need to be vigilant about checking the levels of chemicals in the water and takes steps to improve them, if and when necessary. Following are a couple of our favorite aquaponics tanks for bettas. This gorgeous two-tier acrylic aquarium has plants growing up top and also plenty of room for live plants inside. With a 5 gallon capacity, it’s the perfect size for keeping a single betta fish. Due to the nature of the system, you shouldn’t need to use a filter at all, but it does come with a water pump and built-in filter, in case you need that extra boost. The tank also comes with pots and grow media for the plants, gravel and a natural water dechlorinator. It doesn’t, however, come with any sort of heater, so you are going to need to buy one separately. There’s also no lid for this aquarium, so you’ll need to find one that fits to stop your betta from jumping out. 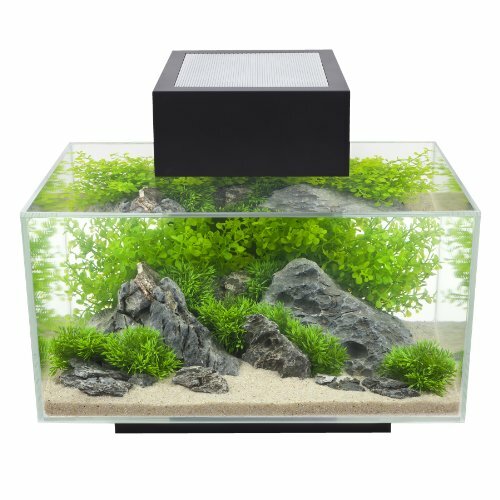 This 3 gallon aquarium is a good starter for someone who wants to try out an aquaponic tank, perhaps with a view to getting something larger and more impressive at a later date. The filter has room to grow a single plant, but you do have the option to switch it over to be used as a regular, non-aquaponic filter if you find this style of tank isn’t working out for you. It is a waterfall style filter, which might create too much water movement to keep some betta happy, but it may be okay on a lower setting. 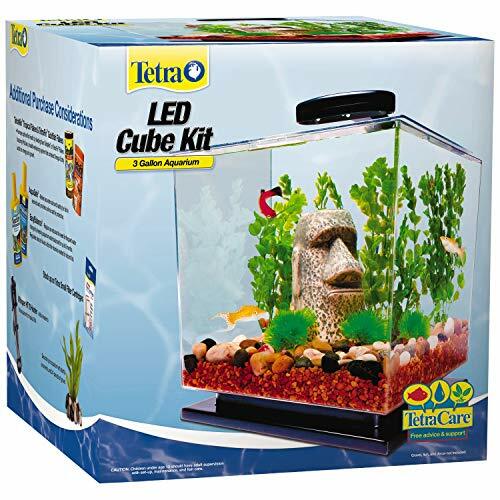 It also comes with LED lighting and growing media for the plant, but you will need a heater to keep the water at the correct temperature for your betta. It also comes without a lid, so you’ll need to buy one separately. This aquarium is a number one bestseller on Amazon and we can see why. It offers excellent value for money and would be a great starter tank for a newbie fish keeper. With a 3 gallon capacity, it’s slightly smaller than is ideal, but it’s perfectly adequate for keeping your fish’s water clean and healthy for them. It comes with a quiet whisper power filter, a filter cartridge, LED lighting and a pedestal base. Again, you will need to buy a separate heater to regulate the temperature. The lid has a convenient feeding hole for no-fuss mealtimes. If you’re totally new to fish keeping, setting up a betta tank – complete with heater, lighting, filter and the right water – can be a bit daunting. Here’s a brief overview of what you need to do to get it ready. Pick a secure spot to house your tank. Somewhere near a window is good, so your fish gets at least some natural light, but it shouldn’t be in direct sunlight. You’ll need to leave some space between the back of the aquarium and the wall for the filter and heater to sit. Make sure the aquarium, substrate, and rocks and ornaments are clean. Wash them thoroughly with hot water, but never use soap or detergent as it can be harmful to your fish. Install the filter according to the manufacturer’s instructions. Put down an ample amount of substrate. Fill to about one-third of the way with water, checking for leaks as you go. Arrange any plants and ornaments in the tank, making sure they’re securely anchored down. Now fill the rest of the way, stopping around an inch from the top. Attach the heater as per the manufacturer’s directions. Set it between 75 and 80 degrees Fahrenheit, which is the optimum temperature range for betta. Add a water neutralizer to remove chlorine from the water. If you used distilled water to fill the tank, this step is unnecessary. Cycle the tank without fish. This will make it safer when you add your betta as the conditions should be correct by the time the cycle has finished. Use a testing kit to check the levels of the water. The pH should be 7, while the ammonia and nitrate should be at 0. Once the levels are correct, you’re ready to introduce your betta. There’s a lot to think about when selecting the best betta tank for your needs. 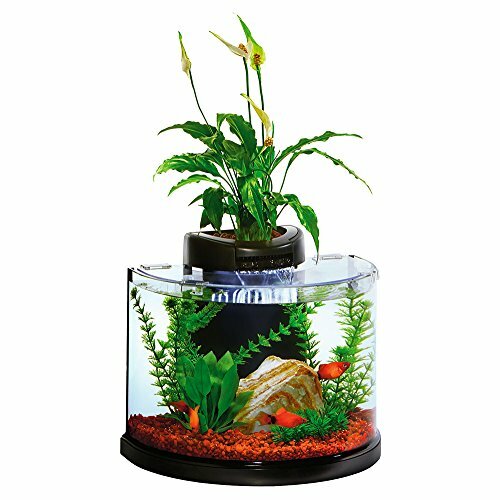 While some people argue you can keep a betta in any old container, even a small jar, this is cruel, as it doesn’t provide the optimum conditions to keep your fish happy and healthy. We’d always recommend picking the largest tank possible, but keeping your betta in anything under 2.5 gallons isn’t fair on the fish. If you’ve read through all the information above, you should have a good idea of what’s required in a betta tank and how to get everything ready to go. While you’d do well with any of the models we’ve recommended above, there are plenty of great aquariums out there, so select whatever makes you happy and will provide a good environment for your fish. Hi. I was looking for a tank that can house multiple betta, but there’s none on your list. Do you have any suggestions? I want to keep 2, but am aware they must be kept apart. I know you can have tanks that have partitions in them? Yes, we purposely left them out, because even in tanks where a pane of glass separates two male betta, they still flare up, want to fight, face off with eachother and it’s very stressful for them. However, we do intend to cover set ups suitable for multiple betta very soon. In the mean time, I would suggest quickly searching google for such solutions. There’s a few models where you have 2 to 4 tanks connected, but on different levels, with no way for a fish to get into another area, but so that a single filter can serve all 4 compartments. I’d look for one of those.